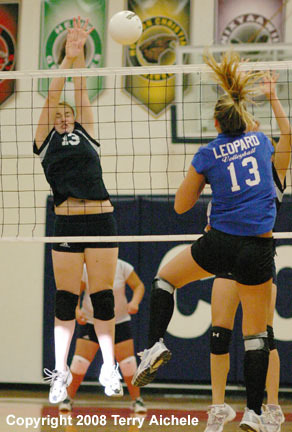 ECHO - The Echo Cougars (1A Big Sky - East) hosted Cove (1A Old Oregon) in a volleyball match on Thursday. 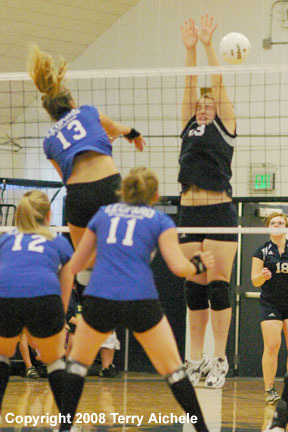 Cove won overall with the set scores of the match being 25-13, 25-16, 16-25 and 25-15. The first set was very evenly played as both teams were able to score. 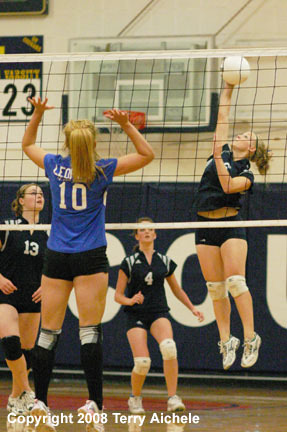 Then with Cove leading 14-13 Jamie Murchison went on a serving streak. Cove was able to score the next 11 points to take a 25-13. In the second set Echo held the lead at 10-9. Then Cove tied it at 10-10 then held long stretches of service with Marlee Asmussen, Mariah Murchison and Caitlyn Doren serving out the game for a 25-16 win. Echo took control of the third set from the start and never looked back. The closest Cove came was at 14-12 at about the midway point of the game. Echo seemed like they really wanted the win to keep from being swept. Echo had some nice attacks and play at the net. Taylor Tarvin had some nice runs a serve during the set. Echo took the set 25-16. The fourth set was a close one with the teams tied 7-7 early on. 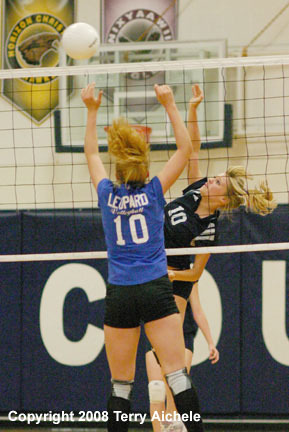 Cove began pulling away on strong sets and determined work at the net. The final of set four was 25-15. LEFT - Echo freshman Kirsten McCallum left, blocks a shot by Tierra Prince of Cove. 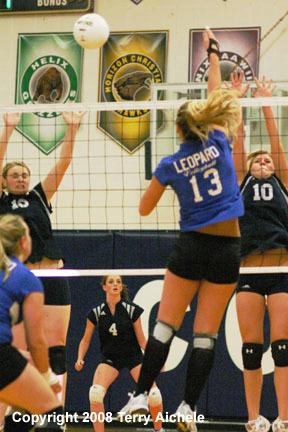 RIGHT - Echo senior Sydney Swaggart spikes the ball. LEFT - Kirsten McCallum of Echo deflects a shot by Tierra Prince of Cove. RIGHT - Tierra Prince of Cove with Kirsten McCallum and Sydney Swaggart defending the net for Echo. 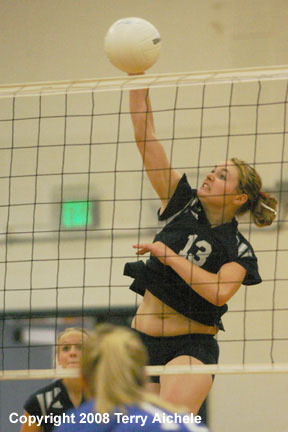 LEFT - Kirsten McCallum spikes the ball. RIGHT - Sydney Swaggart with a shot. 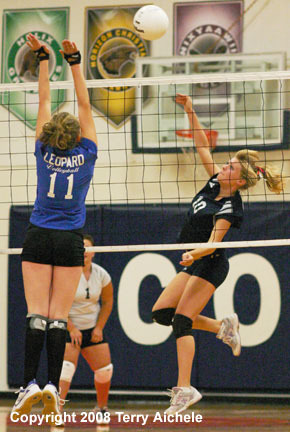 Elizabeth Ferge of Echo goes up for a spike.